If you've ever been to India, you will know what a Hindustan Ambassador is (you've probably ridden in one, almost been run over by one...etc), otherwise you likely haven't ever heard of one. 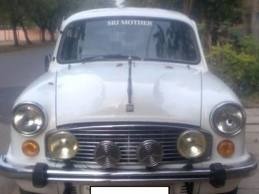 The Hindustan Ambassador is based on the 1956 Morris Oxford III - a long defunct car whose image has lived on as a taxi, limousine and government general purpose auto in the ex-British colony of India. 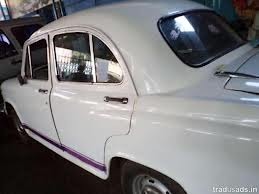 This 1978 Hindustan Ambassador is for sale in Salem, Tamil Nadu, India for र60,000 rupees, or approximately $1120 US dollars via the OLX.in website. In 1957 the entire Morris Oxford series III tooling was shipped to the city of Calcutta, in the province of West Bengal, India. Production began immediately of the re-badged Hindustan Ambassador, a production line that still runs to this day. Only recently has the Ambassador started to be replaced with more modern vehicles for fleet use, but for years it was the go-to car for taxi drivers, policemen and all manner of official government transportation. According to dubious internet legend it is still the preferred transportation method of famous and almost-Prime-Minister of India, Sonia Gandhi. 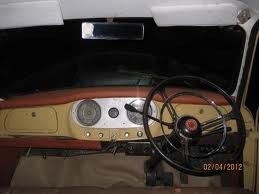 A classic British dashboard and right hand drive greets the driver, but it is clear by this 1978 model that some internal changes were made to the Ambassador, including the addition of a padded dash. Thankfully, this model is equipped with a manual transmission and 3-on-the-tree shifting. Helpful information, thanks for sharing such a great post!